Holi is the first Hindu festival of the year, celebrating the coming of spring. 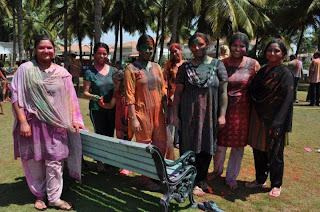 There are different legends attached to Holi, according to the region of India one lives in. Whatever Holi represents, it is a joyful festival. 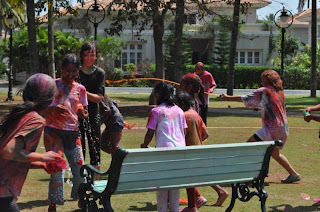 Although the official Holi Festival isn’t until next week, our community celebrated “Playing with Colors” this weekend. I wasn’t sure what to expect and had no idea how many people would show up. 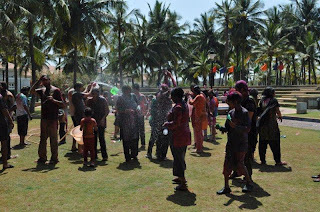 What a surprise to find so many, young and old, throwing paint and water on each other. Everyone giggled as they carefully painted each other’s faces, dumped dry paint over someone’s head or chased down the cleanest person and threw a bucket of water at them. Everyone was in good spirits. It was so much fun and no one went away clean or dry! Most of the paint came off surprisingly well in the shower. The rest came off in the afternoon at the pool. I have been following your blog, and find it very interesting. I, being an Indian living out of India in London, wanted to see a foreigner's perspective of living in India. Thanks for following - it's a great experience from this foreigner's perspective! 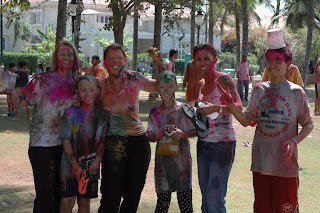 I shall never ever forget my experience of Holi festival. Thanks for this!